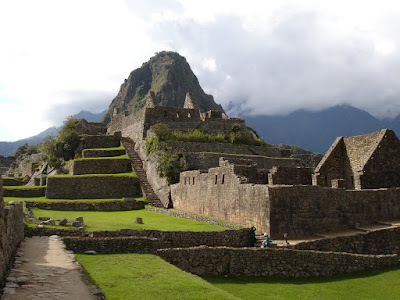 This trip saved the best for last: Machu Picchu and then the magical town of Cusco. This is by far the most beautiful town I have seen in Latin America. It reminded me of the way Quito looked in 1972—before Quito became a big city with high-rises obscuring the view of the mountains. In Cusco wherever we went, the mountains were a powerful presence. Since we were in a city, we could break way from the group and move at our own (very slow) pace. We stayed with the tour for the half day city tour. It’s always good to get an over view before branching out on your own. The first stop was the Dominican monastery— built on the foundations of an Inca Temple. A 1950 earthquake revealed the Inca Temple and the rich heritage the Dominicans had tried so hard to suppress. If we had been on our own we would have spent the entire morning there. Rick and I move slowly through museums, but there’s no leisurely lingering with a tour group and we were on to the next stop. 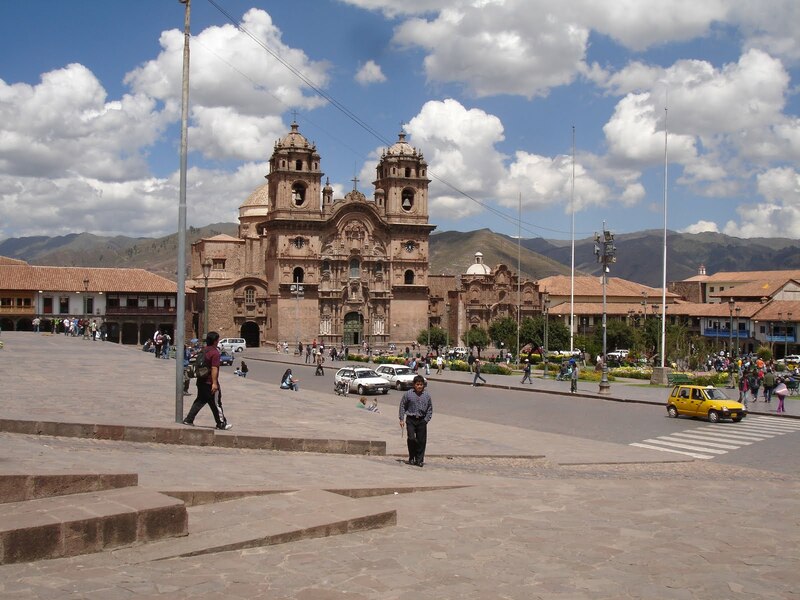 After the city tour, we decided to break away from the group and spend our last day and a half in Cusco seeing the town our way, at our pace. 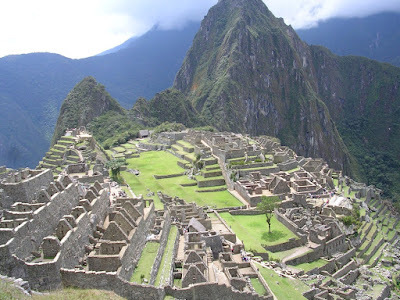 It meant missing a bus tour that included the famous Inca fortress of Sacsayhuaman, but if we had gone on the scheduled tour, we would have been captives on the tour bus and would have had to spend the rest of the day on the shopping trips arranged by the tour company. I’m not much of a shopper and these shopping expeditions seem to be incorporated into most group tours. Rick and I could easily pass on the silver factory and the vicuna factory, but the tour company knows its customers, and most were very happy to have these shopping opportunities. To be fair, one shopping trip, to the workshop of Seminario, a well-known ceramicist, was really worth it, and we bought a beautiful ceramic clock for our kitchen—we actually needed a new kitchen clock, as ours died right before we left for Peru. But this tour was too heavy on the shopping and too light on cultural / historical attractions. So instead of shopping we saw some of the major sites of Cusco—including the cathedral which is actually a complex of churches and a treasure trove of colonial art. When we asked our guide why such a major cultural site was not included as part of the group tour, he said it used to be included but when the cathedral raised the price of admission, the tour company decided to drop the cathedral. Huh? So, bottom line: we’re not going on any more group tours. If we can’t go some place on our own, then we just won’t go there. I’ve accepted the fact that there are many places I will never see, and that’s okay. My husband and I did a lot of traveling during our working years, so I don’t have all these pent-up travel desires. I wish I had done more adventure travel when I was younger, but you can’t do it all, can’t have it all. Rick and I learned something about ourselves as travelers, or perhaps it's more accurate to say the trip confirmed what we always suspected: we are just not meant for group travel. But despite all my complaints, I’m really happy to have seen Machu Picchu and Cusco. If I were younger, I’d plan a return trip for some future date, but at this stage of life, travel opportunities narrow. One trip to Machu Picchu in a lifetime will have to do. Is the future of feminism Meg Whitman, Carly Fiorina and Sarah Palin ? Or is it Hilda Solis, Mary Kay Henry, and the Coalition of Labor Union Women? Last week I read article after article about the rise of Republican women, sometimes framed as a triumph for feminism. According to this storyline, the feminist message is now so mainstream that even Republican women embrace women’s empowerment. I had an experience last week, the annual awards event of the Philadelphia chapter of the Coalition of Labor Union Women (CLUW), which convinced me that the future of feminism lies in a very different direction. I was honored to receive an award (for my service as past president of Philadelphia NOW) in the company of women who have done so much to improve the lives of women who have not been the primary beneficiaries of the feminist movement, working-class and low-income women, who are disproportionately women of color. The cultural change has been so pervasive that many affluent white men have been willing to make room for their daughters--the same men who have fought economic policies which would provide opportunities and a robust safety net for the majority of women. I was disgusted by a horrific Whitman anti-welfare ad that was straight out of Ronald Reagan's 1966 campaign. It was demagoguery: She promised to make welfare recipients seek and take jobs – as though California never passed its own historic welfare reform legislation, doing just that, way back in 1986. It was repellent to listen to her demonize welfare recipients, the vast majority of whom are women and children, at a time when California is already slashing services. This is sure not my kind of feminism! The definition of feminism has always been contested terrain, and now that even Sarah Palin calls herself a feminist, confusion reigns. Right wing feminists have argued that however society is structured, women should be equally represented in positions of power. A much more inclusive definition of the feminist project demands equal opportunity for all women and a robust safety net available to all women. We’re not going to get that with Republican women at the helm. That said, I acknowledge that having women like Whitman and Fiorina in positions of power does normalize the idea of women holding top jobs-–in that sense, it’s a positive. Much has been made of the fact that two women, Barbara Boxer and Carly Fiorina, will be competing against each other to be senator from California. Something potentially far more significant got very little attention: two women, Mary Kay Henry and Anna Burger, were the contenders for the presidency if one of the countries largest labor unions, Service Employees international Union (SEIU). This is not your father’s labor movement. 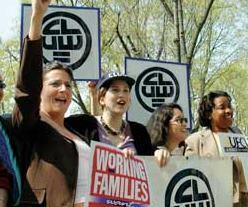 SEIU represents the fastest growing sector of the labor movement and its members are increasingly women, particularly women of color. Granted, the labor movement is far from perfect and I certainly had my problems with the teachers’ union which represented me, but the rise of women in the labor movement may have far more significance for the lives of most American women than the political victories of Republican women like Whitman and Fiorina.